All India Radio & Doordarshan (DD TV) Program & Transmission Executive Jobs Recruitment Vacancy SSC 2013 Prasar Bharti Online application Procedure Apply Date Schedule Interview Eligibility Criteria Pay Scale job location 2013 recruitment Program & Transmission Executive Prasar Bharti. Are you looking for jobs at Prasar Bharti? Do you want to know the latest Jobs at Prasar Bharti? Do you want to work in the post of Program & Transmission Executive at Prasar Bharti? Then let us inform you about the recent Job Vacancy details of Prasar Bharti as Program & Transmission Executive. Prasar Bharti invites application from the eligible candidates for the 2013 Recruitment of Program & Transmission Executive and the details as follows. • Job Location of Program & Transmission Executive Recruitment 2013: - Candidates will be placed in All India Radio, Doordarshan under Prasar Bharti in India. • Prasar Bharti Recruitment & Vacancy Details: - Staff Selection Commission (SSC) invites applications for the recruitment of Program Executive and Transmission Executive posts on behalf of Prasar Bharti through Combined Recruitment Examination. Both these two posts are Group-B posts and selection will be made on the basis of SSC 2013 Combined Recruitment Test to be held on 2nd June 2013. • Eligibility, Qualification Criteria for Program & Transmission Executive Job (Recruitment) of Prasar Bharti: - Please check position-wise criteria at www.ddindia.gov.in [website of Doordarshan Channel] / http://allindiaradio.gov.in [website of All India Radio] / http://prasarbharati.gov.in [website of Prasar Bharti] / http://ssconline2.gov.in [website of Staff Selection Commission (SSC)]. • Where & How to Apply for 2013 Program & Transmission Executive Job (Recruitment) in Prasar Bharti: - Interested candidates can only apply Online through http://ssconline2.gov.in website. Details regarding Prasar Bharti Recruitment through SSC 2013 Combined Recruitment Exam are also available on Employment News / Rojgar Samachar dated 23rd March 2013 and 6th April 2013. Please visit www.ddindia.gov.in [website of Doordarshan Channel] / http://allindiaradio.gov.in [website of All India Radio] / http://prasarbharati.gov.in [website of Prasar Bharti] / http://ssconline2.gov.in [website of Staff Selection Commission (SSC)] for more details. Don’t forget to Apply within the scheduled date for the 2013 Program & Transmission Executive jobs in Prasar Bharti and to brighten your professional career. Editor & Marketing Coordinator Jobs Recruitment Vacancy 2013 Uraan Travel Magazine Online application Procedure Apply Date Schedule Interview Eligibility Criteria Pay Scale job location 2013 recruitment Editor & Marketing Coordinator Uraan Travel Magazine. Are you looking for jobs at Uraan Travel Magazine? Do you want to know the latest Jobs at Uraan Travel Magazine? Do you want to work in the post of Editor & Marketing Coordinator at Uraan Travel Magazine? Then let us inform you about the recent Job Vacancy details of Uraan Travel Magazine as Editor & Marketing Coordinator. Uraan Travel Magazine invites application from the eligible candidates for the 2013 Recruitment of Editor & Marketing Coordinator and the details as follows. • Job Location of Editor & Marketing Coordinator Recruitment 2013: - Candidates will be placed at South Kolkata office of Uraan Travel Magazine. Sub-Editor job at Uraan Travel Magazine - Requirement: - Candidates having knowledge on Tourism & Bengali literature, good proof reader with good computer skill and minimum 3-years of experience in sub editing are eligible to apply for the post. Candidates having experienced in travel oriented studies & culture are also welcomed for the Sub-Editor job at Uraan Travel Magazine. Female PRO / Marketing Coordinator Job at Uraan Travel Magazine - Requirement: - Fluent in English, good communication & computer skill and able to handle marketing field & can work on field depending on situation with Tele-Marketing skills are eligible to apply. South Kolkata female candidates will be preferred. • Where & How to Apply for 2013 Editor & Marketing Coordinator Job (Recruitment) in Uraan Travel Magazine: - Interested & eligible candidates are requested to apply as soon as possible by sending their latest CV, testimonials & photos to uraanhr@gmail.com email id. For further details please visit www.uraantravelmagazine.com website or call 9051581330 / 8981258785 phone numbers of Uraan Bengali Travel Magazine office of Kolkata. Don’t forget to Apply within the scheduled date for the 2013 Sub-Editor jobs in Uraan Bengali Travel Magazine and to brighten your professional career. New Bengali Television Channel High TV Editor, Anchor, Reporter Jobs Recruitment Vacancy 2013 High Media Infotainment India Ltd Online application Procedure Apply Date Schedule Interview Eligibility Criteria Pay Scale job location 2013 recruitment Editor, Anchor, Reporter High Media Infotainment India Ltd.
Are you looking for jobs at High Media Infotainment India Ltd? Do you want to know the latest Jobs at High Media Infotainment India Ltd? Do you want to work in the post of Editor, Anchor, Reporter at High Media Infotainment India Ltd? Then let us inform you about the recent Job Vacancy details of High Media Infotainment India Ltd as Editor, Anchor, Reporter. High Media Infotainment India Ltd invites application from the eligible candidates for the 2013 Recruitment of Editor, Anchor, Reporter and the details as follows. • Job Location of Editor, Anchor, Reporter Recruitment 2013: - Candidates will be placed at Kolkata, Siliguri, Malda, Cooch Behar, Raiganj & across West Bengal. Head of the Department EDITOR Recruitment at High Media Infotainment India Ltd. - No. of vacancy 1. Senior EDITOR Recruitment at High Media Infotainment India Ltd. - No. of vacancy 4. Junior EDITOR Recruitment at High Media Infotainment India Ltd. - No. of vacancy 5. Senior GRAPHIC DESIGNER Recruitment at High Media Infotainment India Ltd. - No. of vacancy 1. Junior GRAPHIC DESIGNER Recruitment at High Media Infotainment India Ltd. - No. of vacancy 2. Trainee GRAPHIC DESIGNER Recruitment at High Media Infotainment India Ltd. - No. of vacancy 1. Senior DESK - SUB EDITOR Recruitment at High Media Infotainment India Ltd. - No. of vacancy 3. Junior DESK - SUB EDITOR Recruitment at High Media Infotainment India Ltd. - No. of vacancy 3. Trainee DESK - SUB EDITOR Recruitment at High Media Infotainment India Ltd. - No. of vacancy 2. Senior DESK DISTRICT Recruitment at High Media Infotainment India Ltd. - No. of vacancy 2. Junior DESK DISTRICT Recruitment at High Media Infotainment India Ltd. - No. of vacancy 2. Senior DESK SPORTS Section Recruitment at High Media Infotainment India Ltd. - No. of vacancy 1. Junior DESK SPORTS Section Recruitment at High Media Infotainment India Ltd. - No. of vacancy 1. Trainee DESK SPORTS section Recruitment at High Media Infotainment India Ltd. - No. of vacancy 1. Senior ENTERTAINMENT REPORTER Recruitment at High Media Infotainment India Ltd. - No. of vacancy 1. Junior ENTERTAINMENT REPORTER Recruitment at High Media Infotainment India Ltd. - No. of vacancy 2. Senior BULLETIN PRODUCER Recruitment at High Media Infotainment India Ltd. - No. of vacancy 3. Senior ANCHOR Recruitment at High Media Infotainment India Ltd. - No. of vacancy 2. Junior ANCHOR Recruitment at High Media Infotainment India Ltd. - No. of vacancy 3. Trainee ANCHOR Recruitment at High Media Infotainment India Ltd. - No. of vacancy 1. Senior REPORTER Recruitment at High Media Infotainment India Ltd. - No. of vacancy 4. Junior REPORTER Recruitment at High Media Infotainment India Ltd. - No. of vacancy 4. Trainee REPORTER Recruitment at High Media Infotainment India Ltd. - No. of vacancy 2. Senior ASSIGNMENT IN-CHARGE Recruitment at High Media Infotainment India Ltd. - No. of vacancy 2. LIBRARIAN Recruitment at High Media Infotainment India Ltd. - No. of vacancy [Chief 1, Senior 1 & Junior 1]. CAMERAMAN Recruitment at High Media Infotainment India Ltd. - No. of vacancy [Chief 1 & Studio 3]. CAMERAMAN OUTDOOR Recruitment at High Media Infotainment India Ltd. - No. of vacancy [Senior 3, Junior 3 & Trainee 3]. MAKE UP PERSON Recruitment at High Media Infotainment India Ltd. - No. of vacancy [Senior 1 and Junior 2]. MARKETING EXECUTIVE Recruitment at High Media Infotainment India Ltd. - No. of vacancy 4. DISTRIBUTION EXECUTIVE Recruitment at High Media Infotainment India Ltd. - No. of vacancy 2. SCHEDULER Recruitment at High Media Infotainment India Ltd. - No. of vacancy [Senior 1, Junior 1]. IT - TECHNICIAN Recruitment at High Media Infotainment India Ltd. - No. of vacancy [Senior 1 & Junior 1]. TICKER Recruitment at High Media Infotainment India Ltd. - No. of vacancy [Senior 1 & Junior 1]. SOUND TECHNICIAN Recruitment at High Media Infotainment India Ltd. - No. of vacancy [Senior 1, Junior 2]. RECEPTIONIST Recruitment at High Media Infotainment India Ltd. - No. of vacancy 2. • Address of High Media Infotainment India Ltd: - Kolkata City Office Address: - 61, Russa Road(East), 1st Lane, 2nd Floor, P.S. Charu Market, Kolkata-33 [Phone number - 95932 00549]. Corporate Office address in Kolkata: - 47/H/1, Ballygunge Terrace, Kolkata–29 [Telephone number – 9593200400]. • Where & How to Apply for 2013 Editor, Anchor, Reporter Job (Recruitment) in High Media Infotainment India Ltd: - Interested candidates are requested to send their applications (CV) mentioning the post applied for to hr@highmediaindia.com as soon as possible. For further details regarding Job openings please visit www.highmediaindia.com website of Bengali Satellite Channel. Don’t forget to Apply within the scheduled date for the 2013 Editor, Anchor, Reporter jobs in High Media Infotainment India Ltd and to brighten your professional career. Trainee Journalist Jobs Recruitment Vacancy 2013 Swarnakshar Prakasani Kolkata Online application Procedure Apply Date Schedule Interview Eligibility Criteria Pay Scale job location 2013 recruitment Trainee Journalist Swarnakshar Prakasani Kolkata. Are you looking for jobs at Swarnakshar Prakasani Kolkata? Do you want to know the latest Jobs at Swarnakshar Prakasani Kolkata? Do you want to work in the post of Trainee Journalist at Swarnakshar Prakasani Kolkata? Then let us inform you about the recent Job Vacancy details of Swarnakshar Prakasani Kolkata as Trainee Journalist. Swarnakshar Prakasani Kolkata invites application from the eligible candidates for the 2013 Recruitment of Trainee Journalist and the details as follows. • Job Location of Trainee Journalist Recruitment 2013: - Candidates will be placed at Kolkata. • Swarnakshar Prakasani Kolkata Recruitment & Vacancy Details: - Swarnakshar Prakasani of Kolkata is leading Bengali paper & magazine publisher that publishes ‘Karma Khetra’, ‘Bhraman’, ‘Pesa Prabes’ & many others. Swarnakshar Prakasani of Kolkata invites applications for the Recruitment of Trainee Journalist in their print media. • Eligibility, Qualification Criteria for Trainee Journalist Job (Recruitment) of Swarnakshar Prakasani Kolkata: - 1st Class Honours or Post Graduate candidates [male & female] with excellent skill of English & Bengali language are eligible to apply for the Trainee Journalist job at Swarnakshar Prakasani of Kolkata. • Age Limitation requirement for Trainee Journalist in Swarnakshar Prakasani Kolkata: - Applicant should be under 27 years of age i.e., maximum age limit is 27 years. • Venue (Address) of Swarnakshar Prakasani Kolkata: - 29/1A, Old Ballygunje Second Lane, Kolkata-19. • Where & How to Apply for 2013 Trainee Journalist Job (Recruitment) in Swarnakshar Prakasani Kolkata: - Interested eligible candidates are requested to send the application mentioning their School name, college name along with marks obtained in examinations to ‘Swarnakshar Prakasani Pvt Ltd, 29/1A Old Ballygunje Second Lane, Kolkata-19’. Don’t attach any copies of mark-sheets while submitting applications but mention ‘Trainee Journalist’ on the application envelop. Candidates may also send their applications online at swarnakshar.prakasani@gmail.com mentioning ‘Trainee Journalist’ in the subject line. Send your applications within 7-days from 5th January 2013. Don’t forget to Apply within the scheduled date for the 2013 Trainee Journalist jobs in Swarnakshar Prakasani Kolkata and to brighten your professional career. Graphic Designers Jobs Recruitment Vacancy 2012 ABP Pvt Ltd Kolkata Online application Procedure Apply Date Schedule Interview Timings Graphic Designers 2012 Jobs Recruitment ABP Pvt Ltd Kolkata Eligibility Criteria Pay Scale job location 2012 jobs recruitment Graphic Designers ABP Pvt Ltd Kolkata. Are you looking for jobs at ABP Pvt Ltd Kolkata? Do you want to know the latest Jobs at ABP Pvt Ltd Kolkata? Do you want to work in the post of Graphic Designers at ABP Pvt Ltd Kolkata? Then let us inform you about the recent Job Vacancy details of ABP Pvt Ltd Kolkata as Graphic Designers. ABP Pvt Ltd Kolkata invites application from the eligible candidates for the 2012 Recruitment of Graphic Designers and the details as follows. • Job Location of Graphic Designers Recruitment 2012: - ABP Pvt Ltd, 6 Prafulla Sarkar Street, Kolkata. • ABP Pvt Ltd Kolkata Recruitment & Vacancy Details: - ABP Pvt Ltd Kolkata is a large media house with publications like the Anandabazar Patrika, The Telegraph, Businessworld, Fortune India, Desh, Sananda, Unish Kuri, Anandalok & Anandamela, is looking for Graphic Designers. • Eligibility, Qualification Criteria for Graphic Designers Job (Recruitment) of ABP Pvt Ltd Kolkata: - Graphic Designers having done Graduation from an Art College / NID / similar Institute and must have an eye for creativity with at least 3 years of work experience in Print Media. He/She should be comfortable in working with Photoshop, CorelDraw, Illustrator, Freehand & QuarkXPress software. Knowledge of Bengali language is required as well. • Where & How to Apply for 2012 Graphic Designers Job (Recruitment) in ABP Pvt Ltd Kolkata: - Interested eligible Graphic Designers are requested to send your application mentioning Name of School, College / Institute and enclose a CD containing your work samples in Jpeg / Tif format [non-refundable and don’t send any mark-sheet / certificate copies] within 7-days from 4th September 2012 to “Senior Manager – HR (Editorial), ABP Pvt Ltd, 6 Prafulla Sarkar Street, Kolkata-1”. Don’t forget to mention ‘Application for Graphic Designer’ on the envelope. Don’t forget to Apply within the scheduled date for the 2012 Graphic Designers jobs in ABP Pvt Ltd Kolkata and to brighten your professional career. News Reader Jobs Recruitment Vacancy 2012 Doordarshan Kendra TV Channel Kolkata Online application Procedure Apply Date Schedule Interview Timings News Reader 2012 Jobs Recruitment Doordarshan Kendra TV Channel Kolkata Eligibility Criteria Pay Scale job location 2012 jobs recruitment News Reader Doordarshan Kendra TV Channel Kolkata. Are you looking for jobs at Doordarshan Kendra TV Channel Kolkata? Do you want to know the latest Jobs at Doordarshan Kendra TV Channel Kolkata? Do you want to work in the post of News Reader at Doordarshan Kendra TV Channel Kolkata. Then let us inform you about the recent Job Vacancy details of Doordarshan Kendra TV Channel Kolkata as News Reader. Doordarshan Kendra TV Channel Kolkata invites application from the eligible candidates for the 2012 Recruitment of News Reader and the details as follows. • News Reader Recruitment Vacancy 2012 Job Location: - Doordarshan Kendra Television Channel Kolkata. • Name of Vacant Posts 2012 Recruitment of Doordarshan Kendra TV Channel Kolkata: - Doordarshan Kendra TV Channel is looking for News Readers [Male / Female] to read News in regional languages like Bengali, Urdu & also in English. • News Reader 2012 Job Interview Venue Address of Doordarshan Kendra TV Channel Kolkata: - Doordarshan Kendra, Doordarshan Bhawan, Golf Green, 18/3 Udaysankar Sarani, Kolkata-95. • Eligibility Qualification Criteria Parameters for News Reader 2012 Jobs Recruitment of Doordarshan Kendra TV Channel Kolkata: - Graduate in relevant language from any recognized University. • Age Limit / Job Experience requirement for News Reader in Doordarshan Kendra TV Channel Kolkata: - Age should be between 21 to 40 years. Candidates should have good voice, language skill, general knowledge & good looking. Applicants with journalism experience / teaching experience / TV or Radio experience will be preferred. • Interview Date Schedule for News Reader 2012 Jobs Recruitment of Doordarshan Kendra TV Channel Kolkata: - Last date for submission of application is 16th June 2012. • Where How to Apply Process of News Reader 2012 Jobs Recruitment in Doordarshan Kendra TV Channel Kolkata: - Applications along with recent passport size color photo & copies of qualification certificates should be sent to ‘Doordarshan Kendra, Doordarshan Bhawan, Golf Green, 18/3 Udaysankar Sarani, Kolkata-95’ superscripting the envelope ‘Application for News Reader’ only by Registered / Speed Post by 16th June 2012. Shortlisted applicants will be called-up for written test followed by Interview session. Don’t forget to Apply within the scheduled date for the 2012 News Reader jobs in Doordarshan Kendra TV Channel Kolkata and to brighten your professional career. 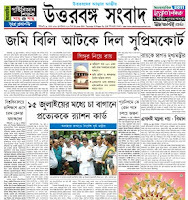 Bengali Magazine Trainee Journalist Jobs Recruitment Vacancy 2012 ABP Pvt Ltd Kolkata Online application Procedure Apply Date Schedule Interview Timings Trainee Journalist 2012 Jobs Recruitment ABP Pvt Ltd Kolkata Eligibility Criteria Pay Scale job location 2012 jobs recruitment Trainee Journalist ABP Pvt Ltd Kolkata. Are you looking for jobs at ABP Pvt Ltd Kolkata? Do you want to know the latest Jobs at ABP Pvt Ltd Kolkata? Do you want to work in the post of Trainee Journalist at ABP Pvt Ltd Kolkata. Then let us inform you about the recent Job Vacancy details of ABP Pvt Ltd Kolkata as Trainee Journalist. ABP Pvt Ltd Kolkata invites application from the eligible candidates for the 2012 Recruitment of Trainee Journalist for a Bengali Magazine and the details as follows. • Trainee Journalist Recruitment Vacancy 2012 Job Location: - ABP Pvt Ltd Kolkata. • Name of Vacant Posts 2012 Recruitment of ABP Pvt Ltd Kolkata: - Recruitment of Trainee Journalist for Editorial Team in Bengali Magazines of ABP Pvt Ltd.
• Trainee Journalist 2012 Job Interview Venue Address of ABP Pvt Ltd Kolkata: - ABP Pvt Ltd, 6 Prafulla Sarkar Street, Kolkata-1. • Eligibility Qualification Criteria Parameters for Trainee Journalist 2012 Jobs Recruitment of ABP Pvt Ltd Kolkata: - Dynamic 1st Class Honors Graduates / Post Graduates are eligible for the post. • Age Limit / Job Experience requirement for Trainee Journalist in ABP Pvt Ltd Kolkata: - Candidates should be between 21-27 years of age. Candidates should have Fluency in English & have flair of Writing in Bengali. • Where How to Apply Process of Trainee Journalist 2012 Jobs Recruitment in ABP Pvt Ltd Kolkata: - Interested eligible candidates should send their Application along with a Photograph mentioning Name of School, College & Percentage of Marks obtained in all Examinations to ‘Senior Manager-HR (Editorial), ABP Pvt Ltd., 6 Prafulla Sarkar Street, Kolkata-1’ within 7-days from 22nd May 2012 mentioning ‘Trainee Journalist – Bengali Magazines’ on the envelope. Candidates may also send their CV to editcareers@abp.in mentioning the email subject ‘Trainee Journalist – Bengali Magazines’. Don’t forget to Apply within the scheduled date for the 2012 Trainee Journalist jobs in ABP Pvt Ltd Kolkata and to brighten your professional career. Are you looking for a job in print media company? Do you want to work as a Reporter or Editor or Photographer in a famous Bengali Newspaper? Here is the opportunity for you because a Bengali Newspaper immediately requires some experienced or fresher for these below mentioned vacant posts in Kolkata and other districts of West Bengal. 1. Sub-Editor job at Bengali News Paper in Kolkata. 2. Reporter job at Bengali News Paper in Kolkata. Reporters to be recruited district wise in West Bengal. 3. District Correspondence job at Bengali News Paper in Kolkata. Job location will be a district of West Bengal. 4. Professional Photographer job at Bengali News Paper in Kolkata. 5. Human Resource (HR) officer job at Bengali News Paper in Kolkata for handling further recruitment. 6. Proof Reader job at Bengali News Paper in Kolkata. 7. DTP Operator job at Bengali News Paper in Kolkata. 8. Sales & Circulation Officer job at Bengali News Paper in Kolkata. Job location will be in Kolkata and other districts of West Bengal. Interested candidates who want to join and work for the upcoming Bengali Newspaper should send their detail CV mentioning the post applied for and job experience (if any) to dc_cosy@rediffmail.com or debangshu.chakraborti@gmail.com within 29th February 2012. Executive Officer-Producer / Production Coordinator-Assistants Jobs Recruitment Vacancy 2012 Srijan Arts Pvt Ltd Kolkata Kolkata Bengal Howrah Hooghly Online application Procedure Apply Date Schedule Interview Timings Executive Officer-Producer / Production Coordinator-Assistants 2012 Jobs Recruitment Srijan Arts Pvt Ltd Kolkata Eligibility Criteria Pay Scale job location 2012 jobs recruitment Executive Officer-Producer / Production Coordinator-Assistants Srijan Arts Pvt Ltd Kolkata. Srijan Arts Private Limited is the popular name of Tollywood Film Industry and now Producer of Super Hit Bengali film ‘Le Chakka’ Director Raj Chakraborty and Actor Dev is looking for smart and dynamic person for the various posts. Srijan Arts Pvt Ltd Kolkata invites application from the eligible candidates for the 2012 Recruitment of Executive Officer-Producer / Production Coordinator-Assistants and the details as follows. • Executive Officer-Producer / Production Coordinator-Assistants Recruitment Vacancy 2012 Job Location: - Srijan Arts Pvt Ltd Kolkata, 10/4B Elgin Road, Kolkata-20. • Name of Vacant Posts 2012 Recruitment of Srijan Arts Pvt Ltd Kolkata: - Recruitment of Senior Executive Officer to coordinate with Film & Media Industry, Executive Producer / Production Coordinator and Executives & Assistance. • Executive Officer-Producer / Production Coordinator-Assistants 2012 Job Interview Venue Address of Srijan Arts Pvt Ltd Kolkata: - Srijan Arts Pvt Ltd Kolkata, 10/4B Elgin Road, Kolkata-20. • Eligibility Qualification Criteria Parameters for Executive Officer-Producer / Production Coordinator-Assistants 2012 Jobs Recruitment of Srijan Arts Pvt Ltd Kolkata: - Applicants should have 3-5 years of experience in relative field and should be fluent in Bengali and English and should have knowledge about computer. • Where How to Apply Process of Executive Officer-Producer / Production Coordinator-Assistants 2012 Jobs Recruitment in Srijan Arts Pvt Ltd Kolkata: - Eligible candidates may send their CV at srijanarts.in@gmail.com as soon as possible or submit their applications at Srijan Arts Kolkata office personally. Don’t forget to Apply within the scheduled date for the 2012 Executive Officer-Producer / Production Coordinator-Assistants jobs in Srijan Arts Pvt Ltd Kolkata and to brighten your professional career. Sub-Editors Jobs Recruitment Vacancy 2012 The Telegraph Newspaper (ABP Pvt Ltd) Kolkata Kolkata Bengal Howrah Hooghly Online application Procedure Apply Date Schedule Interview Timings Sub-Editors 2012 Jobs Recruitment The Telegraph (ABP Pvt Ltd) Kolkata Eligibility Criteria Pay Scale job location 2012 jobs recruitment Sub-Editors The Telegraph (ABP Pvt Ltd) Kolkata. ABP Private Limited is a large media house with publications like the Anandabazar Patrika, The Telegraph, Desh, Sananda, Unish Kuri, Anandalok, Anandamela, Businessworld & Fortune India. ABP Pvt Ltd Kolkata now invites applications for the recruitment of Sub-Editors for The Telegraph Newspaper’s Editorial Section. The Telegraph (ABP Pvt Ltd) Kolkata invites application from the eligible candidates for the 2012 Recruitment of Sub-Editors and the details as follows. • Sub-Editors Recruitment Vacancy 2012 Job Location: The Telegraph (ABP Pvt Ltd) Kolkata. • Name of Vacant Posts 2012 Recruitment of The Telegraph (ABP Pvt Ltd) Kolkata: - Recruitment of Sub-Editors for The Telegraph (Editorial Section) Newspaper. • Sub-Editors 2012 Job Interview Venue Address of The Telegraph (ABP Pvt Ltd) Kolkata: - ABP Pvt Ltd, 6 Prafulla Sarkar Street, Kolkata-1. • Eligibility Qualification Criteria Parameters for Sub-Editors 2012 Jobs Recruitment of The Telegraph (ABP Pvt Ltd) Kolkata: - Honours Graduates or Post Graduates with good command over the English Language & Grammar and should have hands-on-exposure to QuarkXpress and Page Design with creative skills. • Job Experience requirement for Sub-Editors in The Telegraph (ABP Pvt Ltd) Kolkata: - Candidates should be target driven with the ability to conceive articles through research and analysis and the applicants should have around 2-years of work experience in print media. • Interview Date Schedule for Sub-Editors 2012 Jobs Recruitment of The Telegraph (ABP Pvt Ltd) Kolkata: - Last date for submission of application is only 10-days from today. • Where How to Apply Process of Sub-Editors 2012 Jobs Recruitment in The Telegraph (ABP Pvt Ltd) Kolkata:- Please send in your application mentioning name of school, college and percentage of marks in all examinations (marking the envelope “Journalists for The Telegraph” within 23rd January 2012 to ‘Senior Manager – HR (Editorial), ABP Private Limited, 6 Prafulla Sarkar Street, Kolkata-1’ or send via email at editcareers@abp.in mentioning ‘Journalist for The Telegraphs’. Don’t forget to Apply within the scheduled date for the 2012 Editor jobs in The Telegraph Newspaper in Kolkata and to brighten your professional career. Bengali Newspaper of North Bengal requires Journalist & Advertisement Executives Jobs Recruitment Vacancy Uttar Banga Sambad Newspaper Kolkata Bengal Howrah Hooghly Online application Procedure Apply Date Schedule Interview Timings Journalist & Advertisement Executives Jobs Recruitment Uttar Banga Sambad Newspaper Eligibility Criteria Pay Scale job location jobs recruitment Journalist & Advertisement Executives Uttar Banga Sambad Newspaper. Uttar Banga Sambad Newspaper, North Bengal’s largest circulated Bengali Newspaper, invites application from the eligible candidates for the Recruitment of Journalist & Advertisement Executives and the details as follows. • Journalist & Advertisement Executives Recruitment Vacancy Job Location: Uttar Banga Sambad Newspaper, Kolkata office, 7 Old Court House Street, Kolkata-1. • Name of Vacant Posts Recruitment of Uttar Banga Sambad Newspaper: Trainee Journalist recruitment at Siliguri & Malda and few Advertisement Executives recruitment at Kolkata in North Bengal’s Bangla Newspaper Uttar Banga Sambad. • Journalist & Advertisement Executives Job Interview Venue Address of Uttar Banga Sambad Newspaper: 7 Old Court House Street, Kolkata-1. • Eligibility Qualification Criteria Parameters for Journalist & Advertisement Executives Jobs Recruitment of Uttar Banga Sambad Newspaper: Requirement for Trainee Journalist – Honors Graduate with excellent Bengali writing skill, political awareness and the requirements for Advertisement Executives jobs – Graduate with experience in space selling. • Where How to Apply Process of Journalist & Advertisement Executives Jobs Recruitment in Uttar Banga Sambad Newspaper: Interested candidates should apply as soon as possible at Uttar Banga Sambad Kolkata Office address (mentioned above) or by email at career.uttarbanga@gmail.com. Don’t forget to Apply within the scheduled date for the Journalist & Advertisement Executives jobs in Uttar Banga Sambad Newspaper and to brighten your professional career. Animator Artist Jobs Recruitment Vacancy 2011 Animatzione Kolkata Kolkata Bengal Howrah Hooghly Online application Procedure Apply Date Schedule Interview Timings Animator Artist 2011 Jobs Recruitment Animatzione Kolkata Eligibility Criteria Pay Scale job location 2011 jobs recruitment Animator Artist Animatzione Kolkata. Animatzione Kolkata invites application from the eligible candidates for the 2011 Recruitment of Animator Artist and the details as follows. • Animator Artist Recruitment Vacancy 2011 Job Location: Animatzione Kolkata. • Name of Vacant Posts 2011 Recruitment of Animatzione Kolkata: Artist / Trainee Animator (20-posts). • Animator Artist 2011 Job Interview Venue Address of Animatzione Kolkata: Animatzione, 42/223 New Ballygunge Road, Kolkata-39. Phone number – 033-66133651. • Eligibility Qualification Criteria Parameters for Animator Artist 2011 Jobs Recruitment of Animatzione Kolkata: Degree or Diploma in Fine Arts / Commercial Arts. • Age Limit / Job Experience requirement for Animator Artist in Animatzione Kolkata: Age should be within 28 years. • Interview Last Date Schedule for Animator Artist 2011 Jobs Recruitment of Animatzione Kolkata: Within One month from 16th April 2011 between Monday and Friday (10am to 6pm). • Where How to Apply Process of Animator Artist 2011 Jobs Recruitment in Animatzione Kolkata: Eligible candidates may attend above mentioned interview venue personally of email their CV to career@animatzione.in as soon as possible. Don’t forget to Apply within the scheduled date for the 2011 Animator Artist jobs in Animatzione Kolkata and to brighten your professional career. Graphic Artist Illustrators Jobs Recruitment Vacancy 2011 Chhaya Prakashani Kolkata Kolkata Bengal Howrah Hooghly, Online application Procedure Apply Date Schedule Interview Timings Graphic Artist Illustrators 2011 Jobs Recruitment Chhaya Prakashani Kolkata Eligibility Criteria Pay Scale job location 2011 jobs recruitment Graphic Artist Illustrators Chhaya Prakashani Kolkata. Chhaya Prakashani Kolkata invites application from the eligible candidates for the 2011 Recruitment of Graphic Artist Illustrators and the details as follows. • Name of Vacant Posts 2011 Recruitment of Chhaya Prakashani Kolkata: Graphic Artist and Illustrators. • Eligibility Qualification Criteria Parameters for Graphic Artist Illustrators 2011 Jobs Recruitment of Chhaya Prakashani Kolkata: Graduates having knowledge in Illustrator / Photoshop. • Age Limit / Job Experience requirement for Graphic Artist Illustrators in Chhaya Prakashani Kolkata: Fresher Jobs. • Interview Last Date Schedule for Graphic Artist Illustrators 2011 Jobs Recruitment of Chhaya Prakashani Kolkata: Apply as soon as possible. • Where How to Apply Process of Graphic Artist Illustrators 2011 Jobs Recruitment in Chhaya Prakashani Kolkata: Interested candidates are requested to send their CV to info@chhaya.co.in or attend walk-in-interview at above mentioned Chhaya Prakashani Kolkata Office address.